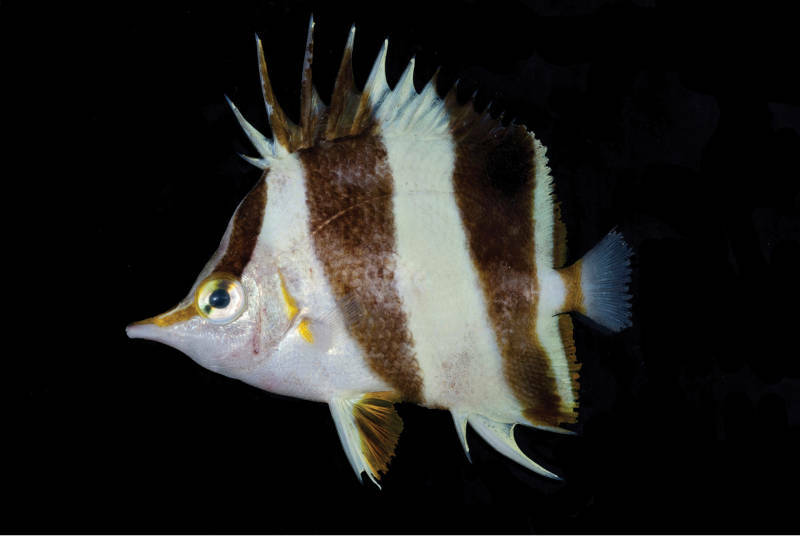 Prognathodes geminus is the new species of butterflyfish from a depth of 116 m off Ngemelis Island in Palau. Body is white with three dark brown bands. The new butterflyfish is considered closely related to Prognathodes basabei (Hawaiian Islands) and P. guezei (Western Indian Ocean). But is different from these species in the number of soft dorsal-fin rays, size of the head, body width and body depth. With this new butterflyfish, the total species under genus Prognathodes comes to 13. Certainly, you can read more about the above on Wikipedia. Most of the above are associated with deep coral-reef environments. Above all, the two specimens were collected with hand nets during deep dives using mixed-gas, closed-circuit rebreathers. The new butterflyfish were brought alive to the surface for photographs and tissue samples. As a result of the finding, the new species Prognathodes geminus was discovered. It is being named as geminus which in Latin adjective means “twin” in reference to Prognathodes basabei. Prognathodes geminusis positively known only from Palau and seen in association with limestone outcroppings on steep slopes at depths of 110–150 m. Further, the above-collected specimens were caught in an area with broken limestone rubble. So, to read more about deep-reef butterflyfish you can check-out ZooKeys.